Ideally situated on a private beach, Hopkins Bay Resort offers a breezy, relaxed vibe. 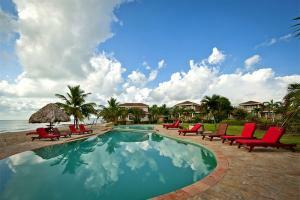 The resort features private 1-3 bedroom beach houses with stunning views of the Caribbean Sea. With jungle, waterfalls, reefs and caves to explore, the hotel offers endless opportunities to embrace the outdoors. For a more leisurely experience, swing in a hammock, indulge in fresh seafood at the Beach Side Restaurant or enjoy a refreshing cocktail at the Drum Bar. Located in Hopkins Bay Beach, just a couple miles from the town's center.